ITALIAN cuisine need not be heavy and drowning in cream and butter, at least according to The Westin Kuala Lumpur’s new expert in the kitchen, chef Vincenzo Sirna. And he has been busy convincing customers at the hotel’s popular Italian restaurant, Prego, one dish at a time since arriving in Malaysia late last year. Having played catch-up with Prego’s signature dishes such as its well-loved baked fish, chef Sirna is nonetheless determined to bring his Sicilian touch into the kitchen. Turning 30 this year, the young but experienced chef left home after finishing school at 18 — his culinary journey taking him first around Italy, then Europe and Australia, and finally Asia in the last three years here. Everywhere he’s been, however, he carries his hometown’s food philosophy with him — “fresh and simple” flavours. He’s already introducing new depths of freshness — and flavours — to Italian cuisine at Prego’s famed Bubbalicious Sunday brunch, where ‘live it!’ sampled some of his pass-around dishes. Sipping on free-flowing Moet Champagne, wine and beer, we indulged in a spread of antipasti that included fresh seafood on ice, a selection of cold cuts and a line-up of cold and warm appetisers. The Caesar salad bar where a chef concocted the perfect poached eggs as well as an extensive variety of cheese rounded it up. From the grill section outdoors, premium cuts of lamb, beef and chicken were roasting on a charcoal grill. Clearly, the winner was a succulent lamb rack cooked on the spot by yet another chef, which came with a choice of oven-baked or roasted vegetables and baked potato. Seafood lovers could opt for yet more grilled options, including a recommended seared sea bass. The real treat at Bubbalicious, though, was the a la carte dishes decided, cooked and often served by chef Sirna himself. After some pizza rounds and a lovely baked oyster dish, out came the pastas. Ravioli took the focus that day, the first served with a vegetarian pumpkin flavour that came with a generous, but not overpowering, amount of cheese and sauce. But it was the squid ink ravioli that made the biggest impression. Fresh and superbly cooked, the savoury taste was a pleasure, but light enough for a hot afternoon. 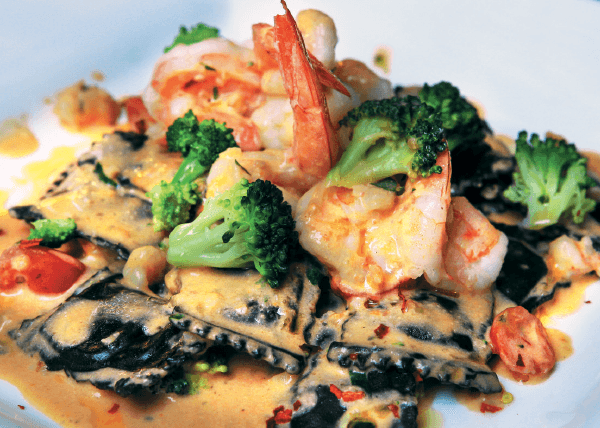 Chef Sirna certainly hopes to keep introducing more traditional dishes like it, so he can educate Malaysians on the different types of Italian cuisine. Of course, his priority is to bring out more southern Italian dishes, which he claims are suitable for our tropical climate. “When you enjoy something, you don’t have to put a lot of sauces, to avoid drawing away from the ingredients,” he reiterates. He draws inspiration from the Sunday family lunches cooked by his grandmother — a tradition he wants to impart. “It is common for families have a feast together, from starters to main course and then dessert,” he explains. Among the dishes he ate growing up is the Sicilian Caponata with sun-dried tomatoes, anchovies and caper. “It goes well with the champagne because of the sourness of the caper and the anchovies,” chef Sirna points out. After they were done with the feast, he says, the family would rest before indulging in a “typical Sunday dessert” in the afternoon with a bowl of Tiramisu or Panna Cotta. Prego’s signature Tiramisu has just that needed kick of rich texture and strong coffee flavour with a hint of sweetness. We would recommend you first try the Sicilian Canolli — a fried pastry shell stuffed with ricotta cheese and coated with crushed peanuts and powdered sugar. The classic dessert is an ode to Palermo, Sicily’s capital. Prego’s all-you-can-eat Bubbalicious brunch is held from 11.30am to 2.30pm every Sunday at The Westin Kuala Lumpur. Prices range from RM148++ to RM338++ per person with discounts for children. For reservations, call (03) 2773 8338.